Kevin’s background in the Letting sector is ideal, not to mention extensive. Previous roles included managing up to 36 property managers and letting agents covering over 1200 properties in Edinburgh, Glasgow, Stirling, Dundee and Aberdeen and he’s worked for some of the most well-known agencies in Edinburgh in both Lettings and Factoring. 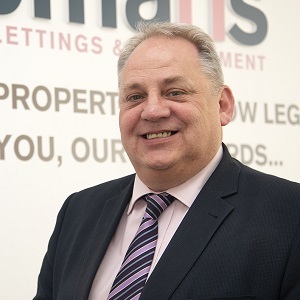 This experience and journey in property management has led Kevin to Chapmans where his ideal job role was in a close-knit, family run business where the first priority is the client and delivering high levels of customer service. Kevin hasn’t always worked in the sector…he also has over a decade’s experience as a maintenance engineer and manager which means his hands on approach and ability to deal with planned and preventative maintenance issues and risk assessments is fine-tuned – a very important aspect of what we do at Chapmans. And to add to his varied repertoire of experience Kevin also served as a Police Officer in Lothian & Borders Police for 12 years as a uniformed police officer and attachments to CID and ID branch. He also has an advanced driving qualification, is a first aider and has undertaken a fire-fighting course, not to mention the numerous Letting sector related courses he has under his belt from SAL and LAS. So overall we are delighted Kevin has joined Chapmans! Kevin is dedicated, pragmatic, knowledgeable and very organised. Coupled with his excellent communication skills and previous lettings experience he is a fantastic asset to our team.